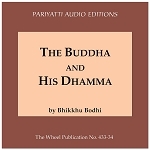 The Wheel is a substantial series of booklets covering a wide range of topics related to Theravada Buddhism—from the analytical philosophy of Abhidhamma to Buddhist reflections on today'’s vital problems. The series also includes accurate annotated translations of the Buddha’s discourses from the Pali Canon. Wheel booklets are 4.8" x 7.2". All Wheels are reprinted in the Collected Wheel Publications series.